Comfortable but not fussy is our motto. We are really a country inn that is not just publicity. And we serve really good food. Hawaii Island is the largest island in the Hawaiian Chain, having more land mass than all of the other islands put together. The Kona side of the island. Hawaii Island is the least populated of all the islands and still very provincial in many ways. The Kona International Airport (KOA) is fast becoming the final destination point for the wise visitor to Hawaii. Due to the new runway extensions, The Big Island has 11 out of 13 world climates and was the favorite island of relaxation for King Kamehameha. As the youngest of the Islands, the surrounding blue Pacific Ocean is one of clearest ocean waters found anywhere with many fine beaches on the Kona side of the island. Kailua Kona is located on the dry side of the Big Island with only 30" of rain and lots of sun every year. Hawaii Island is the least populated of all the islands. Conde Nast elected Hapuna Beach, only 30 minutes north of Kailua, as one of the 10 best white sand beaches in the world. 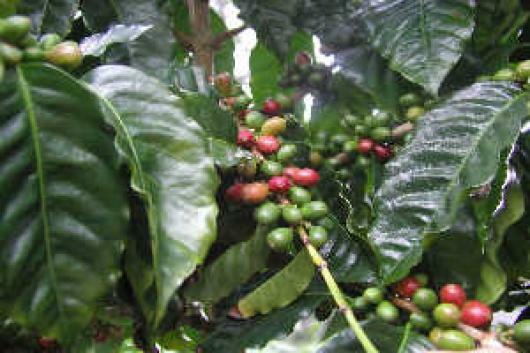 Kailua-Kona hosts the Ironman Triathlon in October each year, the Kona Coffee Festival begins at the end of October. .Guests should allow at least 4 days to take even a quick over view of the Big Island of Hawaii, a week would not be regretted. Driving time around the Big Island of Hawaii is about 5 hours. Remember, Hilo is the wettest city in the U.S. with 10 feet of rain per year. At the volcano it is even wetter rain forest. Some feel it wise to anchor on the Kona dry side of the Island for exploring the Big Island of Hawaii. Kona is the dry and sunny side of the Big Island. It is also close to world class beaches, historical sites, marlin fishing, good shopping and many places to explore. 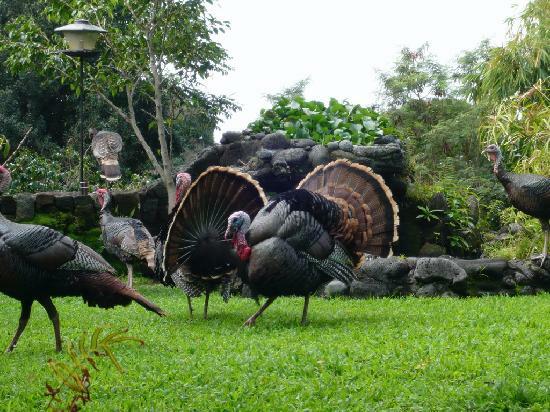 The Big Island still has that gentle touch of Aloha from old Hawai'i. Kona is where the historical kings (Alii) of Hawaii elected to live. Kailua-Kona Just 3 miles. Very Centrally Located. After leaving the airport, turn right on Highway 19, which will merge into Highway 11 at Palani Road. Continue on about 2 more miles further south past the town of Kailua-Kona, and watch for a green reflective sign on the right that says Holualoa 3 Miles. Turn left at that intersection and go up the hill. (There is a left turn lane). Our Box Number is 76-770 Hualalai Road. 1.5 miles up this windy road, you will come to 10 MPH signs on the right to slow down for a very sharp horse shoe turn. Also look for the 4 round blue reflectors on the power pole. Our Inn is in the middle of the horse shoe curve on the right. There is a lighted lamp post and a sign above the mailbox, Hale Maluhia Bed & Breakfast . Go clear to the end of the cement driveway to the second garage door. The front door will be on the right, the porch lights will be on. Please ring the Queen Mary ships bell upon your arrival, we will be looking for you if we know when you are coming. Note: if coming from Hilo or the volcano and you reach Lako Street on Highway 11, you can turn right and go up to Hualalai Road and turn left (down the hill) to our Inn. If we don't know your arrival time and no one is at the Inn just go on into the house and make yourselves at home. Scout out a cup of tea if interested, it's OK. We are not touchy, we are way laid back and comfortable. 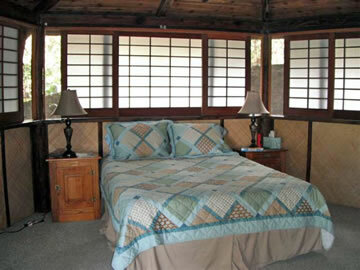 Maile Room, Cozy room with queen bed with private bath and entrance. 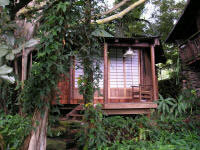 This is an excellent room for covering business needs on a visit to the Big Island. Cable TV,DVD and RoadRunner wireless. Jasmine Room, This a second story, attic/dormer room, in the style of Swiss Family Robinson. It is a large room 11' x 21' with a queen bed and a full bed with a full size working desk. Room for that second couple or the kids. The room has no party walls so is like a cottage and comes with Air Conditioning, Refrigerator, Microwave and a private bath and entrance. The room has cable TV, DVD and RoadRunner broadband wireless access. Very Private. (3rd or 4th person in the room: $25. ea. 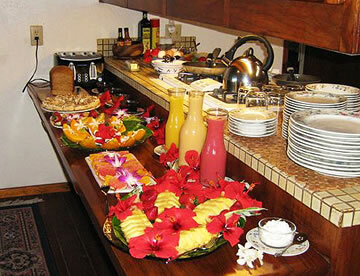 inc. breakfast) This room was specially Created for Ken's grand daughter Jasmine. Please note: If the second bed is used by a couple there will be an additional $15. housekeeping charge. Lovely Lava stone setting under a giant banyan tree. 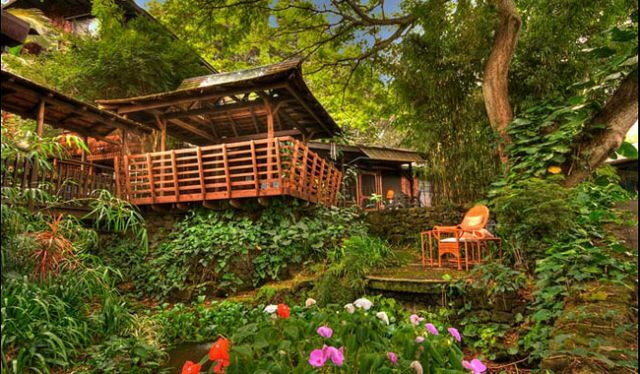 The Tea House is a 300 sq. ft. Gazebo with Japanese Shoji windows and doors and includes attached private New Japanese wet bath with Porcelain Ofuro (hot soaking tub) and special Carara Marble wet shower with marble lavatory and inclosed toilet. Comes with a new TV, cable, DVD, Broadband wireless, Exceptional movie library and a good writing desk. Has a good Queen Bed but can accommodate a family with a couple of kids by putting futons on the floor. Floor is also double padded for exercise. 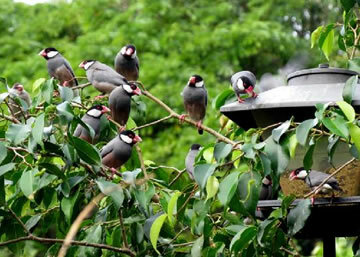 Includes our Breakfast Lovers Buffet and self service Omelet bar with bird watching. This is one of a kind for that very special time. Free hard surfaced parking. If you rent a small Jeep, you can park at the front door. Longer stay discount of 10% for 7+ nights. $25. 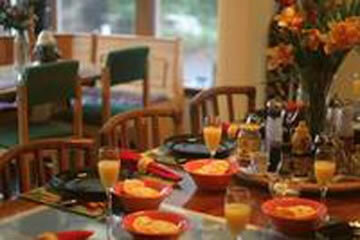 for extra person in room or cottage above 2 for breakfast and linens. Add 15% for a single night stay. 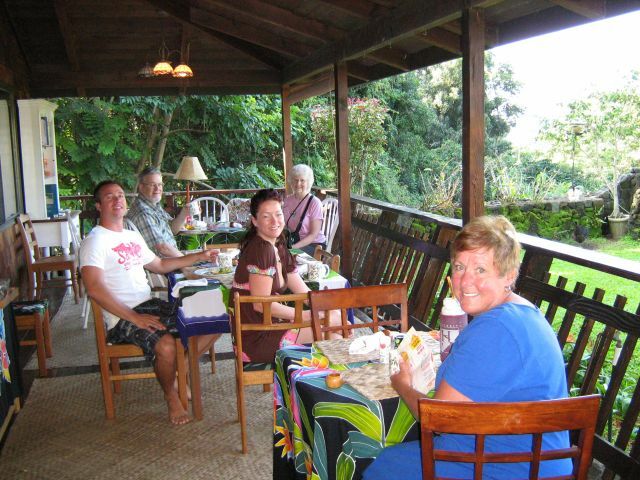 Breakfast Lovers Lanai Buffet with Bird Watching. Includes Hawaiian fruits of the season, pastries, fresh bread each morning, our own recipe and a do it yourself, Omelet Bar. Pure Kona grown Coffee or tea, milk and juice and a Cereal Bar. 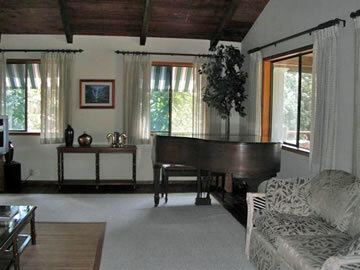 Hale Maluhia Country Inn (house of peace) has a common area music room with a well tuned grand piano and other instruments. The grounds are very special and have many places to sit and read a book with koi ponds and waterfalls. The near acre is covered with big shade trees for a very comfortable summer. The building were built to feel 100 years old by the owner/contractor to give the feeling of an old Hawaiian Plantation House with a soft touch of aloha along the road less traveled. Please deduct 10% for stays of 7 nights or longer. Courtesy to Travel Agents. Reservations require a one night minimum deposit or 50% of the total reservation, which ever is greater. 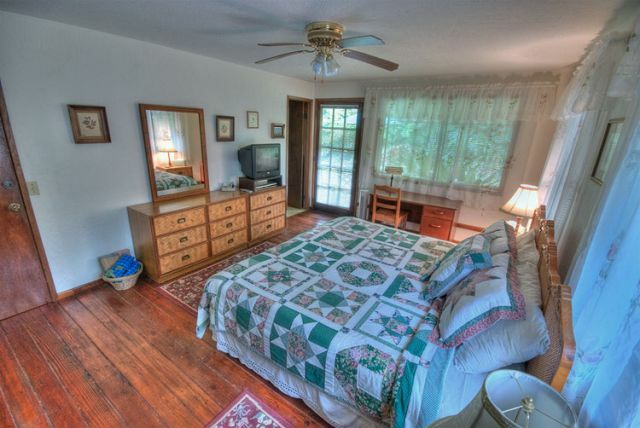 The room or cottage is considered "sold" at that time. Thirty days prior to arrival date we do allow for a full refund of the deposit less a 10% booking fee. Cancellations and deposit refunds within 30 days of arrival are subject to re-booking. Cancellations within 7 days of arrival date and "no-shows" will be charged in full unless re-booked. All cancellations are charged a 10% booking fee. Cancellations must be made in writing and have a management acknowledgment to be valid. Discounts do not apply and deposits are not refunded during special events and holidays. We hold, but do not normally process, a visa or master card for the security of the reservation. Due to the high cost of credit cards we prefer cash, travelers checks or money orders upon arrival. But we will accept Visa and Master Card if necessary. Peaceful unique B&B up in the hills above Kona.